A strange smell lurks in the bathroom. Nifae~ "No it wasn't.... it was me." Wham, Bam, No thank you, Ma'am! Lillsy Bills is getting all busted up! The other night she and O went in for the same toy and their foreheads collided. Wanna guess who took the bigger hit?? She has been sporting a blue goose egg ever since. Today has been a pretty harsh one for some strange reason. Today she was sitting on my bed. She can climb on and off my bed but today she did something totally unexpected. She was reading (playing) with a book and dropped it off the bed on purpose. Then she just leaned over to look at it and tumbled right off. Head first. It was so sad. She was rubbing her head and whimpering. SAD!!! A few hours later we were playing outside. Nifae was giving O and Lills a ride in the wagon. I was on the phone with my mom because her house just got broken into. I saw Nifae going too fast and yelled for him to slow down. Just then he turned them onto the grass and the wagon tipped over. Lills fully hit the grass hard. All the while Owen lets out a "woohoo" as he flew through the air. Lilia was shocked and then super sad. Crying, screaming, sad face, cry. It was heartbreaking. Nifae was crying cause he was so sad that he was responsible. After lunch I got her ready for her nap. 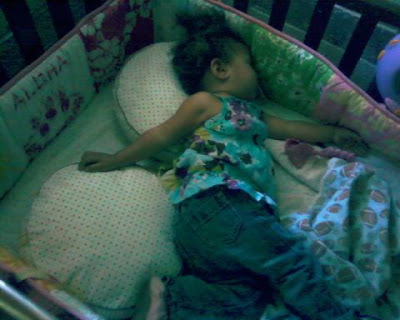 I laid her down in the crib like I do twice a day. She usually never cries and today was no different. I run in and see her HANGING BY A THREAD... literally. 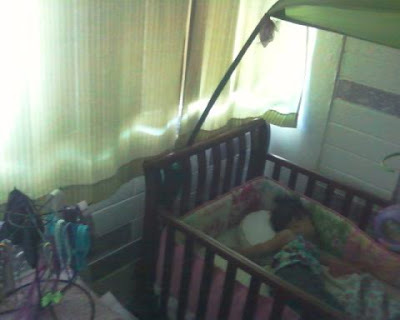 Next to her bed is a dresser that has a carousel thingy that hold all of her head bands. It looked like she had leaned over her crib to grab the headbands and she got one but ended up slipping over the edge. Her foot was holding her onto the crib and the headband she managed to get had stayed attached to the carousel and was totally stretched out as she clung on for dear life. She was so scared. I got her calmed down and she is now sleeping. I need to take a nap so I can gear up for whatever else she has planned today.